Genetically pure bison at the bison roundup, at Wind Cave National Park in South Dakota. Some of these bison were then transplanted to a prairie reserve in Montana to help establish a pure herd. MALTA, Montana — At the old Weiderrick ranch in north-central Montana, four dozen people lined up along a fence, braving a chilly November day. They waited patiently in a harsh wind, staring in silence at a holding pen across a 40-acre pasture. Finally, the massive, shaggy occupants of the pen emerged: 16 genetically pure bison, including six pregnant cows. It was a major step for the onlookers, all staff and supporters of the American Prairie Foundation and World Wildlife Fund. The conservationists have worked for years to bring bison back to the area after an absence of more than a century. The Montana-based Prairie Foundation has bought five contiguous ranches, including the Weiderrick spread — a total of 31,000 acres of private land and leased public land (HCN, 8/2/04: A Greening of the Plains). With the Wildlife Fund, it’s embarking on an ambitious attempt to rehabilitate a huge swath of native prairie. The bison are a key component. "We want to let bison be bison," says Curt Freese, the Wildlife Fund’s Northern Great Plains program director, "let them roam, let them be wild in a way that they can again claim their ecological role." If things go as planned, by next summer this small herd will roam 1,200 acres of open prairie. Over the next two years, more bison will be released here, boosting the total to about 50. After that, natural reproduction should suffice. There’s talk of someday running tens of thousands of bison on millions of acres in the region. The large wandering herds, through their intensive but sporadic grazing, would once again maintain a mosaic of grassland habitats for birds, prairie dogs and other wildlife, while converting vast quantities of grass into food for predators and scavengers. The project faces predictable hurdles. Local ranchers worry that the bison will escape fences and wreak havoc among cattle herds. 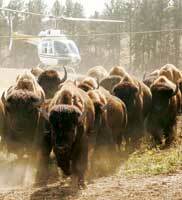 The conservationists respond with promises to manage their bison carefully, create new jobs and spur ecotourism. But one obstacle is not so well known: The West, it turns out, has almost no wild, genetically pure bison left. The genetic crisis began in the 19th century, when market hunters nearly destroyed North America’s bison, reducing an original population of about 60 million to a few hundred. As a result of other conservation efforts on public land, and a boom in bison ranching, the population has now rebounded to roughly 500,000. But the number is deceiving. Almost all modern bison are managed for commodity purposes, particularly meat production (HCN, 6/8/98: Don't fence me in). Bison that act wild, jumping fences or defending calves, are typically culled from those herds, says Cormack Gates, a University of Calgary associate professor who heads the World Conservation Union’s Bison Specialist Group. Commodity bison are also bred to have bigger rumps and smaller humps than wild bison, "trying to produce better meat for the stores, which really has nothing to do with the ongoing evolution of the animals, but rather, the evolution of profit margins," Gates says. And, he says, there’s a more "insidious" problem: Even in the herds managed for conservation purposes, almost all bison are descendants of animals that were experimentally crossbred with cattle in the early 1900s — a legacy that cannot be undone. That’s the finding of James Derr, an associate professor of veterinary pathobiology, and his colleagues at Texas A&M University. Over the last 10 years, they’ve analyzed DNA in hair or blood samples from more than 100 private herds in the U.S. and almost every public herd in North America. Only one herd of privately owned bison that the researchers tested — on billionaire Ted Turner’s Vermejo Park Ranch in New Mexico — has no cattle DNA in its genetic makeup. Of the many untested private herds, Derr says, "It’s a safe assumption that most probably do have some evidence of cattle genetics." The situation in the public domain is little better. Enough members of the bison herds in Yellowstone National Park and South Dakota’s Wind Cave National Park have been tested that Derr is confident in declaring them hybrid-free. Bison in Utah’s Henry Mountains also appear to be genetically pure. But that’s about it. Altogether, according to Derr’s research, there are only about 6,000 pure bison in North America. Derr is now studying the effects of the genetic infiltration. Among other problems, it may cause changes in the bison’s life cycle, because cattle have been bred "for high productivity (in birth rates) and short lives," while wild bison produce fewer calves over a longer lifespan, Gates says. The prairie conservationists decided not to transplant their first batch from the biggest genetically pure herd, in Yellowstone, because that herd is infected with brucellosis, a livestock disease that has spread to wildlife (HCN, 2/6/06: The Killing Fields). Instead, they tapped the Wind Cave herd, which has about 400 bison. They hope their Montana herd will grow to become the largest pure herd, and a source for starting other pure herds elsewhere. They believe that the bison’s innate variety of locally adapted genes has enabled this iconic species to thrive under harsh conditions; if the wild gene pool is reduced, they say, bison may be less able to survive in the future. It’s also an "aesthetic issue," Freese says. "Do you want a Mona Lisa (painting) that’s in perfectly good shape, or do you take one that has a big scratch across it?" Frances Backhouse is a freelance writer based in Victoria, British Columbia. Ray Ring, HCN’s Northern Rockies Editor, contributed to this report.